Yesterday, Rob Petersen, Tim Peter and I gave a Webinar on using analytics to make search marketing decisions. How is your search marketing working? Are you getting the results you want? Maybe you don’t even know how to measure results. Your analytics are essential to your initial search marketing plan and improvement plans. No matter where you are starting from, understanding how to measure where you are and take it to the next level makes all the difference. 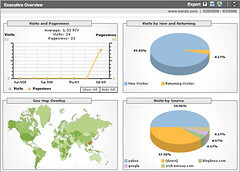 Do you know how your Web analytics can drive your search improvement plan? In this free one-hour Biznology® Webinar, you’ll get a handle on what your own business can do to drive its search marketing results based on measurements. Whether you don’t know how to measure your results or you’re just plain unhappy with them, this Webinar is for you. If you are interested in more information about in-person individual training in search marketing from Rutgers, online courses from the UC Irvine Extension, or an on-site customized corporate workshop by our very own Biznology team, click here.